All normal range safety rules apply. These are the rules for the match itself. This is a compilation of rules from two different clubs, who use slightly different rules, but mostly the same. Pin type: Five full size bowling pins for all calibers larger than .22 rim fire. six inch (five inch at Custer, WA.) Bowling pin tops for rim fire. Pin tables: 36" to 40" high. Eight feet wide, four feet deep. Typically four tables are required, but you can get by with only two. Pin spots: Pins are spotted 16 inches apart, twelve inches from the front edge of the table for pin tops, and for center fire calibers more powerful than .38 Special/9mm. Spots for 38 Special/9mm. and below are sixteen inches from the rear edge of the table. Format: Matches are head-to-head. The first shooter to get all five pins ON THE GROUND OR BERM wins the round. Pins knocked over must be shot off the table and onto the ground. Tie tables are shot over. Each round is two out of three to advance. Either single or double elimination can be used. If double elimination, the final round should be three out of five. Timing In: Each shooter shoots four tables, of five pins per table, individually timed. The shooter's three best times are added together, and the first round match-ups are determined by qualifying times. Match-ups can be either fastest against next fastest down to slowest against next slowest, or fastest against slowest, or however you want to do it. Fastest against next fastest is best for new shooters, as they get to shoot against other new shooters, in most cases. Other schemes for match-ups can also be used. Timing in is a good idea, rather than perhaps just a luck-of-the-draw match-up, as it allows every shooter to get warmed up a bit, and to be sure everything is working OK.
Start: Referee's commands are typically "Shooters to the line", "Load and make ready. ", "Ready on the left", "Ready on the right", and "Standby." Shooter's start position can be either be with gun touching the table, if there is a table, or with the gun pointed down at a 45 degree angle. When the referee's timer horn blows, the shooters commence firing until the referee announces either "Winner on the Left", "Winner on the right", or "Tie table". 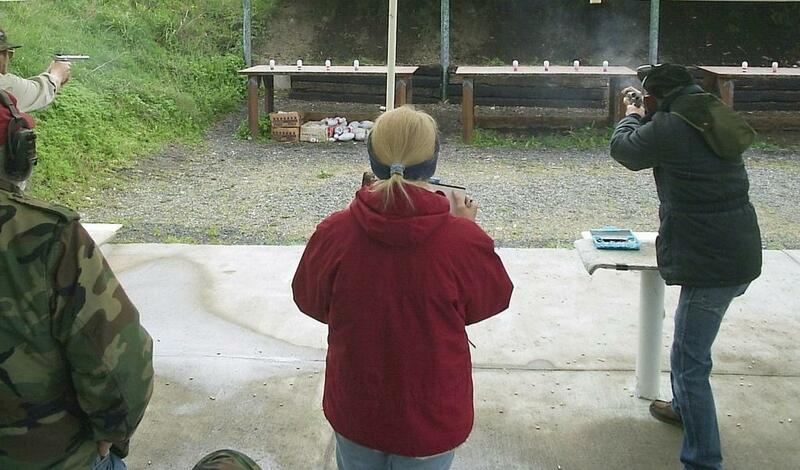 Magazines: Rim fire shooters can load no more than ten rounds in their first clip. Center fire shooters can load no more than eight rounds I their first clip. Ammunition: Lower velocity center fire bullets can bounce back off of a bowling pin with devastating results, so full metal jacketed bullets are not allowed. Hollow points are OK. Classes: Rim fire optical sight, rim fire iron sight, revolver, semi-auto center fire are the basic classes, but you can split large caliber and smaller caliber center fire into two classes, or split center fire into two classes where if you win or place in the lower division a number of times, you move up to the advanced class. I put this together in somewhat of a hurry, so if there are any questions, or any rules omitted, please leave me a comment and I'll update the post. For tables you can start out as simple as using saw horses and plywood for tables, but they WILL get shot up fairly quickly. Heavy steel tables are the way to go if you decide to do a lot of pin shoots. Pin shooting is the most profitable club activity at Central Whidbey Sportsmen's Association. Entry fees are $8 for center fire, and $5 for rim fire. The rim fire winner gets $1 per rim fire entrant. In the center fire classes, first and second pay, but I forget the exact amount. The balance goes to the club. Some clubs also have a "Fast Table Time" pot, where you can put a buck in the pot, and the whole pot goes to the fastest table time when timing in. If your club is looking for a way to make a few bucks, have some fun, and try something different, you might just want to try a pin shoot. If you do, send me some pictures and I'll put them up on Mr. Completely!! I'm a french shooter and enjoying a lot cleaning a table from pins. I was looking for rules while finding this page, your article has helped me a lot. I have seen 2 bullets come straight back at the firing line. One hit my wife in the chest. It was a Fall shoot and she had a jacket and a sweater on. She felt a thump on her chest and found a 44 mag bullet in the bottom of her jacket. She keep it for a good luck piece! I am the chairman of the South African Pin Shooting federation. We at present have members in South Africa in four provinces numbering about 1500. They have league shoots once a month, with National shoot taking place in one of the provinces yearly. We are accredited with the Central firearm registry of South Africa and also The South African Sports Shooting Federation. A few years ago we were affiliated with second Chance USA, that seems to have died as our e-mails have no response. With a eager following of shooters we are trying to contact a parent body we can affiliate with so that at some time we can arrange a world shoot. Here in shooting ,hoping to here from you. How many rounds of Ammo should I take to a shoot? Not all clubs run their matches the same, so phone the match director first, and he can advise youon how much you need. Carnival of Cordite #20 is up - Life is Good!! Anybody Wanna Buy a Swamp?